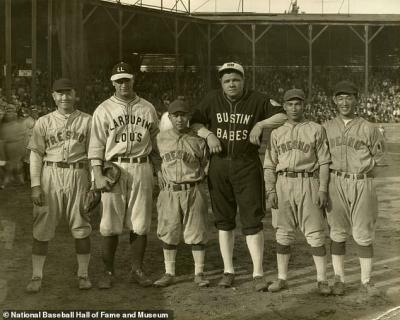 A closer look at old baseball footage displayed in an exhibit at the Japanese-American National Museum in Los Angeles has revealed two remarkable discoveries: New York Yankees legends Babe Ruth and Lou Gehrig. The exhibit, 'Common Ground: The Heart of Community,' includes hundreds of objects and photographs from over 130 years of Japanese-American history, some of which involve a shared passion for baseball. That contribution comes in the form of a film made by Reverend Sensho Sasaki, who recorded parts of the Ruth-Gehrig barnstorming tour in Stockton, California. Remarkably, the museum had the grainy footage for years, but nobody realized that it contained Ruth or Gehrig, despite the presence of both of their distinctive left-handed swings. That all changed when the Baseball Hall of Fame's Tom Shieber paid a visit, and noticed the previously unidentified footage. 'When I visited the Japanese-American National Museum in Los Angeles, I never thought I'd bump into previously unidentified footage of Babe Ruth and Lou Gehrig during their barnstorming tour of 1927,' Shieber wrote on Twitter. 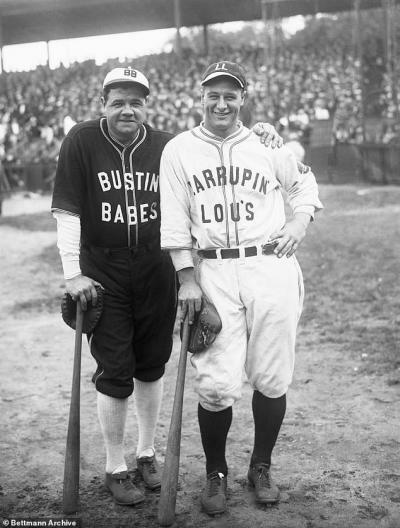 According to Shieber, the barnstorming tour was agent Christy Walsh's idea, and it split locals between Ruth's team, the Bustin' Babes, and Gehrig's Larrupin' Lou's. In places like Fresno, which had a large population of Japanese descent, players from a local Japanese-American All-Star team were used. One short stretch even shows the heavyset Ruth walking gingerly off the field as he reached for his lower back. Previously, the only known footage of the barnstorming tour came from a game with some members of the Japanese-American All-Star team that took place in Fresno, California on October 29, 1927. At the time, Sasaki was filming many aspects of Japanese-American life on his own 16mm camera. And luckily for the baseball world, he attended the Ruth-Gehrig barnstorming tour. Heh. Bustin' Babes and Larrumpin' Lous. Man can't believe it took someone this long to notice Lou and The Babe in the footage. Can you imagine living in a small city and having Mike Trout and Aaron Judge show up for a game with your local team? What a thrill that must have been to see these heroes who you could only see in newsreels coming to your town! Where can someone view this?